Raw Banana Starch – Yes or No? 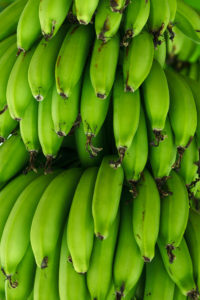 Green Bananas are good source of resistant starch. Is green banana flour? 1. Under-ripe bananas are an excellent source of resistant starch, but as the bananas ripen, the starch naturally converts to sugar. Are the extracted ingredients standardized on the quantity of resistant starch in any way? Unless each batch is measured, you’ve got no way of knowing how much resistant starch is actually there. Unless you can verify what you’re getting, you can assume that you’re getting whatever is cheapest to produce. 2. Like most natural sourced resistant starch, it is not process tolerant and will cook out (lose its resistant starch content) when baked into bread, heated or otherwise processed. No, banana bread made with raw banana flour will NOT be a good source of resistant starch! Those writers and articles that claim that it does are simply misinformed (likely just wrong). a. Dr. Jorge Ble-Castillo and his colleagues in Mexico published an article in the International Journal of Environmental Research and Public Health in 2010 that highlights some of the questions. Obese individuals with type 2 diabetes consumed 24 grams of native banana starch each day for 4 weeks, which was measured to contain 8 grams of resistant starch. Plasma insulin and insulin resistance were reduced after the individuals consumed the native banana starch, but the results were not significant when compared to the control (24 g. of soy milk powder). However, the individuals lost more body weight while consuming banana starch compared to the control. From my perspective 8 grams of resistant starch is simply not enough to impact insulin sensitivity. A previous study with African Americans at risk for type 2 diabetes in Virginia found similar effects with 12 grams of resistant corn starch/day. It is possible that the results would have been better with more banana flour, or with a different control, or with individuals with pre-diabetes instead of type 2 diabetes. As I said, promising, but not quite enough. b. Professor Elizabete Menezes and her colleagues in Brazil published in Food Research International recently compared unripe banana flour containing resistant starch as well as inulin in healthy adults. This study had participants consume either 5 grams of resistant starch or 8 grams of inulin in soup a total of 3 times each week for 6 weeks. The control group consumed 2 grams of maltodextrin (highly digestible sugar) in a similar pattern. They demonstrated reductions in the insulin response to both unripe banana flour and inulin as well as increased ghrelin and PYY (gut hormones related to satiety and hunger). They did not find any significant difference in the amount of food consumed compared to the control. It is hard to say what this study means. It may contribute to the evidence supporting resistant starch from unripe bananas, but the results are not clear. They’re in the right direction, but still unclear. c. Dr. Jorge Ble-Castillo and his colleagues in Mexico also just published a 2015 clinical study showing that native banana starch (measured to contain 34% resistant starch) reduced the glycemic and insulin response in obese and lean adults compared to digestible corn starch. This demonstrates that it resists digestion and reaches the large intestine. This is a very good study, but is only the beginning of resistant starch’s physiological impact. In summary, green banana flour sounds good. It may turn out to be good after procedures are worked out to reliably quantify the resistant starch content. It just has some uncertainties now. I believe it will turn out to be a good food source, but may not be a good ingredient because it has lower and variable levels than other sources. I consider it a tentative Maybe.